As relationship managers, we’re tasked with knowing exactly what brings our customers value and helping customers grow their businesses so our business can grow too. But how do you form deep customer relationships when you’re managing hundreds of accounts? To do our jobs effectively, relationship managers need to know many of the same things traditional customer success managers know. We need to know how our customers are using our products, what their business objectives are and how we can help them reach their goals. The big difference is we have to build all our relationships at scale without having one-to-one conversations with every customer (as much as we’d like to do so). That’s no small feat. Here at Intercom, one way we’ve tackled this problem is by creating personalized videos. Pairing automated in-app messages with personalized videos has enabled us to strike that delicate balance between being efficient and being human. Nearly 50% of our customers opened our first video message! That was huge considering the industry average for in-app messages is an open rate of 26%. 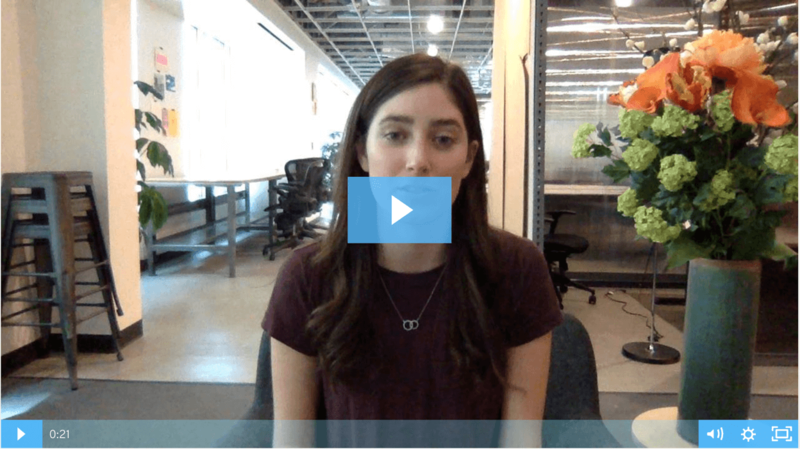 I’ll walk you through the three-step process you can use to try personalized videos in your own customer campaigns. Personalized videos can make a world of difference to your customers, but only when they’re designed to drive a specific action. In the same way your customers are tired of you “just checking in” over email, sending a personalized video just to send one won’t get you anywhere. The best ones help customers do, learn or accomplish something. The first time we tested personalized video was to encourage customers to fill out a survey on satisfaction and usage. We suspected putting faces to our names would make customers more likely to respond and plant the seeds for more meaningful relationships. So we used the video to do two things: introduce ourselves and explain how the survey would help us better serve them. We took a very casual approach to filming it. I just found a comfy corner of the office and recorded the video on my computer. I chose the best take and uploaded it to Wistia, our video tool. Our customers really liked the informal nature of theses videos. Many of my customers, especially the ones new to Intercom, replied with positive feedback – “That’s so kind of you ” and “Liked this video and question set-up!”. Their responses let me know we were on the right track as a team and that I’d gotten these relationships off to a good start. Keep it casual: Customers want to feel like they’re connecting with a real person. Don’t say anything you wouldn’t say in person and use your normal tone and voice. Get to the point: While you don’t want to speed through your video, remember to respect your customers’ time. I suggest keeping your videos under one minute. Don’t be too self-critical: While no one likes to see themselves on camera, chances are you’ll nail it in the first few tries. Keep it under 10 takes and just choose the best one. Once you know what your goal is and you’ve filmed your video, all that’s left to do is set up the message you’ll use to contact your customers. Follow these steps to prepare and send your message via the messaging tool of your choice. In our case, we used Intercom’s Smart Campaigns to automatically message our customers with the personalized video and survey link. Schedule a time and hit send: Since my goal is to establish a relationship with my customers, I knew I wanted to be around if any of them replied back. So I scheduled my in-app message to trigger first thing in the morning and then set it live. End result? With personalized videos, we were able to drive nearly 1,000 customers to complete the survey. More than that, it gave us valuable information about them, including where they were and weren’t seeing success. That helped us identify opportunities to educate them about products they were already using or show them how other Intercom products could help different parts of their business grow. For example, if a customer was having trouble capturing leads at the top of funnel, I’d suggest using Intercom’s live chat solution to send targeted messages to website visitors and engage leads in real-time. When you’re managing hundreds of customer accounts, you’re inevitably going to run into this problem: how do you make your outreach efficient but still human? Leveraging personalized videos enabled us to lay the foundation for meaningful customer relationships and critically, to do so at scale. But it’s important to remember this is just one part of a much bigger, sustained effort to get to know our customers and provide them with value. Building lasting relationships means investing in your customers across their entire lifecycle and a personalized video is just one important touch among many. The post Build customer relationships at scale with personalized videos appeared first on Inside Intercom.